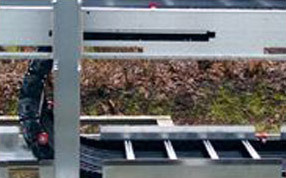 Due to the substantial friction, it is nearly impossible to realize travel lengths greater than 200 m. With the new rail cable carrier, the upper trough does not glide on the bottom trough, it glides on guide rails. Rollers are mounted on ball bearings at the side of the carrier. 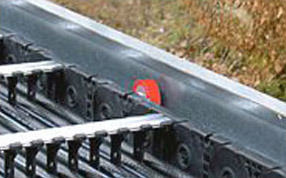 The guide rails come in the standard connection height. The carrier does not sag. The tension and thrust is 90% less in comparison to gliding arrangements. 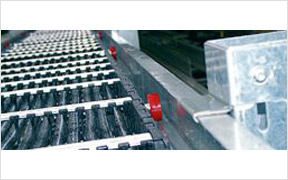 The rollers run on the guide rail and do not contact other rollers. Ball bearings and a polyurethane roller surface additionally contribute to quite and smooth operation. On the Rail Cable Carrier RCC - the driven connection is located at bend height. On gliding arrangements with a lower driver connection an extended loop overhang is required. This area cannot be used for travel. Less space required, and no additional turnaround length. Save money with minimum carrier, cable and channel lengths. 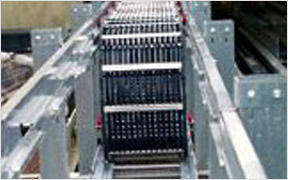 The carrier is subject to a minimum load which minimizes wear and optimizes the service life. 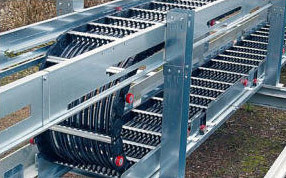 RCC systems are especially gentle on cables since they are only bent at the bending radius of the carrier. There is no counter-bending as is used in gliding arrangements. The carrier does not climb dangerously in the acceleration phase due to the decreased friction and associated reduced thrust. For additional safety, the top of the channel forms a U-shape which holds the carrier guide rails in case of malfunctions.